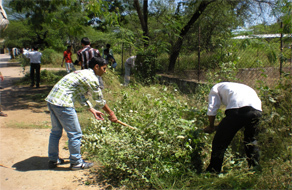 The college has two units of National Service Scheme (NSS), where students are trained for social services. The main works carried out by the NSS units are tree plantation, general awareness, literacy projects, community health programs, debates/discussions on socially relevant issues (like dowry, AIDS, prohibition on liquor etc). In case of emergencies and other traumatic conditions NSS volunteers donate blood. They also work on campus beautification. Camps are organised from time to time. The activities channelize the energy of youth in constructive works. Students who work regularly for two years get a Certificate. Such students get bonus marks/ priority in admissions as per the Government rules.